How did the story about RESILIENT RED come about and what is the theme of this story for children? RESILIENT RED came about during a week we had off from school in West Palm Beach due to Tropical Storm Isaac. I had never seen so much rain fall at once--pounding our Earth; relentless in power, as the water just kept growing and growing covering our lawn and cars. Ultimately, it reached the pad of our home just outside of the sliding glass doors. There was no way to even get the car out from the garage. I took out the kayak and paddled my way out on to the street. We had over 17 inches of rain delivered with Isaac—it was an amazing week of Mother Nature’s ferocity and power. The theme of the book came about when I did have the opportunity to venture outside to observe a long, branch from a tree—part in the pond and part touching the only mound of dirt visible through the rain water. The only life that was busy building, carrying on as if nothing had happened, were the Florida red ants. Almost in disbelief, I thought, “How inspiring!” Immediately, I took this theme of ‘survival’ and started to write this book for children on the third day of Isaac, in honor of perseverance and teamwork, on the part of the red ants. How did you decide to have a red ant as your main character in this children’s book? I often have the ‘underdog’ coming forth as a main character make strides and have successes in my stories. I like to take the ‘unlikeable’ and make them loveable. It was fitting to take a mostly “dislikable” character, such as red ants, and make ‘Red’ my character of inspiration. Sometimes you have to see the great qualities over the not-so-good characteristics. Truly, Red turned out quite adorable, thanks to MATT LUMDEN’S (illustrator) creative and whimsical artistic interpretation of the manuscript. The teamwork of the ants surviving Isaac will remain forever with me; I just had to share their endurance and teamwork with children. 3. How did you create the title for this children’s book inspiring them to ‘be strong’ during a storm? 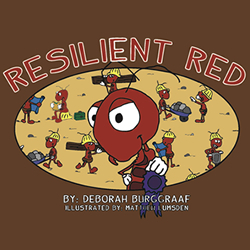 Originally, the book was titled, RESILIENT RED SAYS…” We dropped the word “Says” and made it RESILIENT RED, because it is clearly the ant speaking to the readers throughout the story. And I was hesitant to use the word, Resilient, in the title. I was not sure if the children would understand the meaning of this word. However, after reading and discussing the term in context, I think it is a word that should be in everyone’s vocabulary. I just returned from nearly a month in San Diego. While there, I wrote two new books: The Lovebug Connection and The Dogma of Golf. What books are scheduled for upcoming releases? IOf course, Resilient Red will be released in the Fall of 2014. Following this, SASHA’S BIRTHDAY PARTY and ANHINGA AND THE FLORIDA BOX TURTLE will be out in the Fall of 2015.